GREAT FALLS, MT. 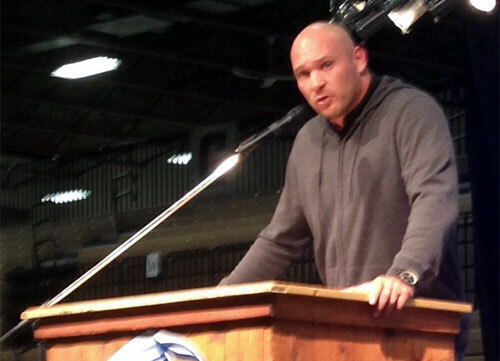 — Retired Chicago Bears eight-time Pro Bowl selectee, Brian Urlacher, was the featured speaker on Friday, April 10, 2015 at Montana State’s Triangle Classic annual banquet. The event attracts more than 1,500 Bobcat fans to town and, thanks to a Great Falls group of MSU fans that includes Jim Walden and Brett Keaster, usually includes an appearance by an NFL legend. Source: Scott Mansch, Great Falls Tribune. Brian Urlacher is an eight-time Pro Bowl selection and was named 2005 NFL Defensive Player of the Year as a linebacker for the Chicago Bears. The Bears did not renew his contract for 2013. Urlacher established himself as one of the NFL’s most productive defensive players. After winning the NFL Rookie of the Year Award in 2000, he was elected to eight Pro Bowls, and won the NFL Defensive Player of the Year award in 2005. His playing style, accomplishments and reputation have made him one of the team’s most popular players.